The discovery of X-ray "stripes" in the remains of an exploded star may help astronomers learn how some of the highest-energy particles in our galaxy reach their incredible speeds, a new study suggests. NASA's Chandra X-ray Observatory spacecraft detected a suprisingly regular pattern of X-rays in a well-known supernova remnant called Tycho. The new observations provide the first direct evidence that a cosmic event can rocket particles to energies 100 times higher than those achieved by Earth's most powerful accelerators, researchers said. The find may also help scientists figure out how some of those super-speedy particles — which are known as cosmic rays, and constantly bombard Earth— are produced, they added. The Tycho supernova remnantis located in our own Milky Way galaxy, about 13,000 light-years from Earth in the constellation Cassiopeia. It's named for the Danish astronomer Tycho Brahe, who reported observing the supernova in 1572. The event likely occurred when a white dwarf star grew so much in mass that it eventually exploded in a so-called Type Ia supernova, researchers said. 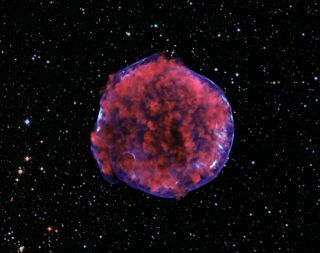 Chandra peered at the supernova remnant for more than 200 hours back in 2009. Over these extended observations, the spacecraft picked up some strange X-ray stripes in Tycho. These stripes provide support for a theory about how exploding stars accelerate charged particles to incredible energies, researchers said. This Chandra image shows the higher energy X-rays detected from the Tycho supernova remnant. These X-rays show the expanding blast wave from the supernova, a shell of extremely energetic electrons. Close-ups of two different regions are shown, region A containing the brightest stripes of tangled magnetic fields and region B with fainter stripes. When a star explodes, it creates a fast-moving shock wave that spreads through space. High-energy charged particles — such as protons and electrons — can bounce back and forth across this shock wave repeatedly, gaining energy with each crossing. One theory predicts that, near this ever-expanding shock wave, magnetic fields become highly tangled and the motions of the charged particles extremely chaotic. This creates a messy network of X-rays, with some "holes" of little emission and some "walls" with lots of the stuff. Researchers think Tycho's stripes are evidence that this is happening. The stripes are likely the "walls" of theory — regions where the magnetic fields are more tangled than surrounding areas, and where particle movement is more turbulent. In these areas, protons and electrons become trapped and spiral around the magnetic field lines; the electrons emit lots of X-rays in the process, researchers said. However, the regular and almost periodic pattern of the X-ray stripes was unexpected. It wasn't predicted by theory, researchers said. "It was a big surprise to find such a neatly arranged set of stripes,"said co-author Jack Hughes of Rutgers. "We were not expecting so much order to appear in so much chaos. It could mean that the theory is incomplete, or that there’s something else we don’t understand." The researchers published their results last month in The Astrophysical Journal Letters. This illustration explains what scientists believe is occurring in the X-ray stripes in the Tycho supernova remnant. The blue, circular region on the left is a schematic representation of the outer shell making up the blast wave of the supernova remnant, with the lighter colored regions being the stripes. The right side panels show close ups of those regions where magnetic field lines are entangled. The spacing of the X-ray stripes likely indicates proton energies about 100 times higher than those reached in Earth's most powerful particle accelerator, the Large Hadron Collider — and they're equivalent to the highest-energy cosmic rays thought to be produced in our galaxy, researchers said. That result also supports previous theory, as supernova remnants have long been considered a good candidate for producing the Milky Way's most energetic cosmic rays. Protons can reach energies hundreds of times higher than the highest-energy electrons, but since they do not radiate X-rays efficiently like electrons do, direct evidence for the acceleration of cosmic ray protons in supernova remnants has been lacking, researchers said. The new results also support the prediction that magnetic fields in interstellar space are greatly amplified in supernova remnants. The difference between the observed and predicted structures, however, means that other interpretations cannot be ruled out. "We were excited to discover these stripes because they might allow us to directly track, for the first time, the origin of the most energetic particles produced in our galaxy,"Eriksen said. "But we’re not claiming victory yet."